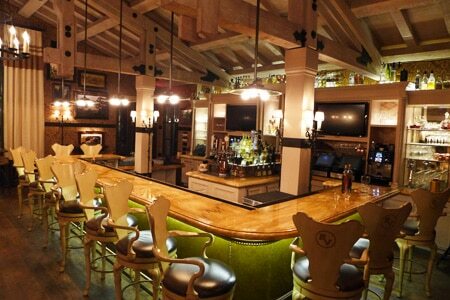 Enjoy upscale rustic bistro fare in an equestrian-inspired setting at Rancho Valencia Resort & Spa. : Drawing both locals and Rancho Valencia Resort & Spa guests alike, The Pony Room is a fun, easy place for a drink, simple lunch or hearty dinner. (It's also the de facto clubhouse for tennis players at the resort.) With its high wood ceilings, the room is warm and welcoming at night and bright during the day when sunlight streams through the large windows. Settle into a comfortable leather chair in a cozy corner or perch at the bar, which is backed by two TVs. More seating is available on the indoor-outdoor terrace and patio overlooking the tennis courts and croquet lawn, respectively. The rich equestrian history of the area is reflected in the interior design, which features paintings of polo matches and bar stools with hoof-shaped feet and “RV” emblazoned like a brand. Servers are attired in riding pants and boots, further emphasizing the theme. The menu offers “California Coastal” cuisine, starting with shared bites like grilled fish tacos, lobster sliders and stuffed sweet peppers with organic quinoa and goat cheese. Also available are salads, flatbreads and “rustic” fare such as a slow-roasted top sirloin dip. Along with craft beers and wines on draft, there’s an extensive tequila collection boasting bottles like Clase Azul “Ultra.” (Connoisseurs should look into the resort’s All Agave Club, which includes significant discounts on monthly agave spirit tastings among its perks.) Happy hour is offered Sun.-Thurs. from 3 p.m.-6 p.m. and 9 p.m. to closing.